Box Text: - The Culmination of Eternal Determination. With the unique R.A.H. Battle Mode, you can create your own battle BGM on which you synchronize your heart with the heroine's! Improve your Song-Magic by exploring the worlds within the heroine's minds! Explore all of the different personae of the Heroines to find your favorite! 04-12-2014 foxhack Description - "The latest volume of the Singing RPG series comes to the Playstation 3 System"! 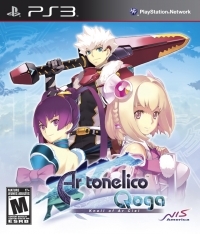 - This game is the third game in the "Ar tonelico" series. - It is the 1st in the series to both be on the PS3 and, the in-game combat of this game is more of an Action/Real-time type of combat where the combat in the 1st two games was much more turn-based in style. *Interested in the earlier games in the series? * 1st game was: "Ar tonelico: Melody of Elemia" (PS2 game released in 2006)...and * 2nd game was: "Ar tonelico II: Melody of Metafalica" (PS2 game released in 2009). 04-12-2014 foxhack Box Text - The Culmination of Eternal Determination. - Heart Resonating Songs. With the unique R.A.H. Battle Mode, you can create your own battle BGM on which you synchronize your heart with the heroine's! -Dive Into The Soulspace. Improve your Song-Magic by exploring the worlds within the heroine's minds! - Evolving Heroines. Explore all of the different personae of the Heroines to find your favorite! 05-27-2012 disgaeniac Description - "The latest volume of the Singing RPG series comes to the Playstation 3 System"! 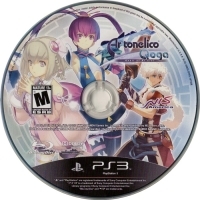 - This game is the third game in the "Ar tonelico" series. - It is the 1st in the series to both be on the PS3 and, the in-game combat of this game is more of an Action/Real-time type of combat where the combat in the 1st two games was much more turn-based in style. *Interested in the earlier games in the series? * 1st game was: "Ar tonelico: Melody of Elemia" (PS2 game released in 2006)...and * 2nd game was: "Ar tonelico II: Melody of Metafalica" (PS2 game released in 2009). 05-27-2012 disgaeniac Box Text - The Culmination of Eternal Determination. - Heart Resonating Songs. With the unique R.A.H. Battle Mode, you can create your own battle BGM on which you synchronize your heart with the heroine's! -Dive Into The Soulspace. Improve your Song-Magic by exploring the worlds within the heroine's minds! - Evolving Heroines. Explore all of the different personae of the Heroines to find your favorite! This is a list of VGCollect users who have Ar Tonelico Qoga: Knell of Ar Ciel in their Collection. This is a list of VGCollect users who have Ar Tonelico Qoga: Knell of Ar Ciel in their Sell List. This is a list of VGCollect users who have Ar Tonelico Qoga: Knell of Ar Ciel in their Wish List.